A tiny fear in paleo land we all must deal with is our friends. Take it to the next step and also be in keto land. Now there also is a denial of potatoes, sugar and any carb laden riches of the world. So what do you do when everyone is going to be eating together? The glorious mouthgasm moments of a dinner party. Or a party at all. You need food that you and others will enjoy but without cheating. Do not fret my loves. Most people actually enjoy the foods of keto and paleo naturally. They are what your body is meant to desire. I don’t have any cravings for the foods not allowed anymore, and love the foods that enter me. We can have bacon wrapped onion rings, creamed spinach, kale soaked in bacon grease with goat cheese inside, and even doughnuts, mug cakes and brownies if we so choose. We just ignore foods that hold amazing foods. Bread is just used for holding and we have lettuce wraps as well as bread substitutes to hold our meats and veggies. Rice is also flavorless unless you add spices and we have cauliflower rice. Most of the foods we lose were only delicious when flavor was added. Now we use foods that are delicious despite flavor addings. 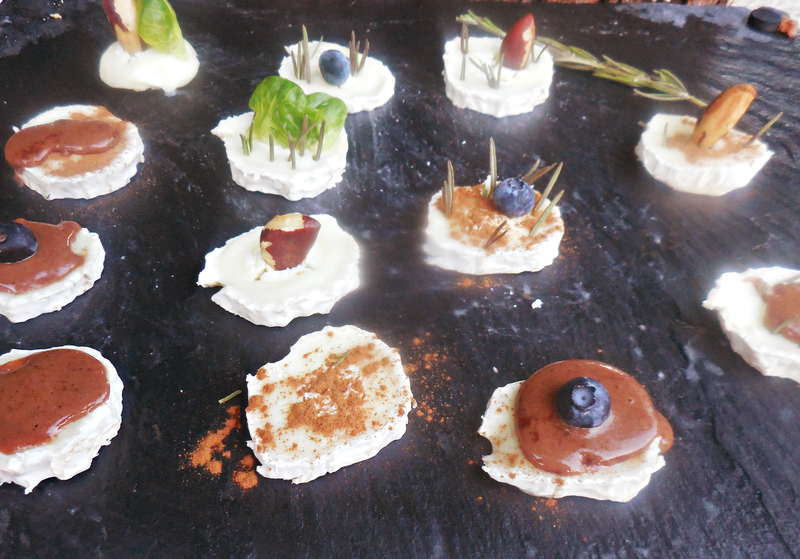 For example: goat cheese platters. I purchased goat cheese with the skin on it due to excitement in using it for the beef tongue casserole. Turns out this was more of a goat cheese you slice than the creamy love my mouth knows. It looks beautiful in platter form though and my favored form was quickly acquired and goes so well with cherries or atop a fried egg. For this platter you cut the cheese into slices and poke food in. I put Brussels’ leaves, rosemary sprigs, cinnamon and Brazilian butter in random moments. I even added kale sprouts. I personally tried all of them and concluded kale sprouts do not go well. Neither does dried rosemary. Fresh should be delightful though. I crisped up the Brussels leaves to see how that would mouthgasm. Crisped is even better than raw. Go ahead and finish arranging the cheese and veggies/spices. Then realize you’ve lost the light for picture taking. Put the tray in the fridge until the lighting returns. Take pictures again the next day. Realize the fridge was an excellent idea because the skin peels right off. Brussels’ leaves and a raw Brazilian nut is the best combination. Just do half a tray of that and half a tray of a dollop of nut butter with cinnamon and a berry. Beautiful and you will be bringing both a savory and dessert flair to the party. No just..don’t do that one.